School/tradition: Categorized historically as a Young Hegelian. Precursor to Existentialism, individualist feminism, Nihilism, Post-Modernism, Post-structuralism. Johann Kaspar Schmidt (October 25, 1806 – June 26, 1856), better known as Max Stirner, was a German philosopher, who ranks as one of the literary grandfathers of nihilism, existentialism, post-modernism and anarchism, especially of individualist anarchism. Stirner's main work, The Ego and Its Own, also known as The Ego and His Own (Der Einzige und sein Eigentum in German, which translates literally as The Individual and his Property), first published in 1844, has since appeared in numerous editions and translations. Stirner was a member of a group of German intellectuals calling themselves "The Free" (Die Freien), subsequently categorized as "Young Hegelians," which included Bruno Bauer, Karl Marx, Friedrich Engels, Ludwig Feuerbach, and Arnold Ruge. Stirner offered an approach to human existence which depicted the self as a creative existence. He claimed that all religions and ideologies, as well as the authoritative institutions of society, such as the state, legislation, the church, and educational systems, rested on empty concepts. Stirner's method of self-liberation was opposed to any kind of "dogmatic presupposition." He advocated an insurrection brought about by "insurgents," people rising above personal, social, political and ideological limitations, to "walk their own way," and bring about the enlightenment and welfare of others by demonstration and example. Many thinkers read, and were affected by The Ego and Its Own in their youth, including educator Rudolf Steiner, Gustav Landauer, Carl Schmitt and Jürgen Habermas, and many ideas associated with post-left anarchy criticism of ideology and uncompromising individualism are clearly related to Stirner's thought. Stirner is recognized as an awkward predecessor of Nietzsche. Karl Marx and Engels were at first intrigued by Stirner’s ideas but later devoted five hundred pages of The German Ideology to mocking and ridiculing his work. What is known of Stirner’s life is mostly due to the Scottish born German writer John Henry Mackay, who wrote a biography of Stirner (Max Stirner - sein Leben und sein Werk), published in German in 1898. An English translation was published in 2005. Johann Kaspar Schmidt was born in Bayreuth, Bavaria, on October 25, 1806, the only child of Albert Christian Heinrich Schmidt (1769-1807), a flute maker, and Sophia Elenora Reinlein (1778-1839) a Lutheran. Just six months after he was born, his father died of tuberculosis, and in 1809 his mother remarried with Heinrich Ballerstedt, a pharmacist and settled in Kulm (now Chełmno in Poland). Schmidt later adopted the pen name “Max Stirner” from a schoolyard nickname he had acquired as a child because of his high brow (Stirn). 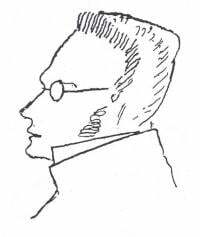 Stirner attended university in Berlin, where he studied philology, philosophy and theology. He attended the lectures of Hegel, who was to become a source of inspiration for his thinking (Hegel's influence on Stirner's thinking is debatable, and is discussed in more detail below.) While in Berlin in 1841, Stirner participated in discussions with a group of young philosophers called "The Free" (Die Freien), and whom historians have subsequently categorized as the so-called “Young Hegelians.” Some of the best known names in nineteenth century literature and philosophy were members of this discussion group, including Bruno Bauer, Karl Marx, Friedrich Engels, Ludwig Feuerbach, and Arnold Ruge. For a lively account of Die Freien see: Robert James Hellman. Berlin- Red Room and White Beer. While some of the Young Hegelians were eager subscribers to Hegel's dialectical method, and attempted to apply dialectical approaches to Hegel's conclusions, the left wing members of the Young Hegelians, led by Feuerbach and Bauer, broke with Hegel. 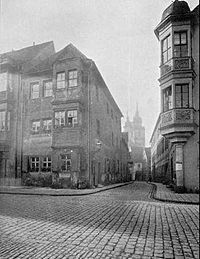 Frequently the debates would take place at Hippel's, a Weinstube (wine bar) in Friedrichstraße, attended by, amongst others, the young Karl Marx and Friedrich Engels, at that time still adherents of Feuerbach. Stirner met Engels many times; Engels recalled that they were "great friends (Duzbrüder)" but it is still unclear whether Marx and Stirner ever met. It does not appear that Stirner contributed much to the discussions but was a faithful member of the club and an attentive listener. 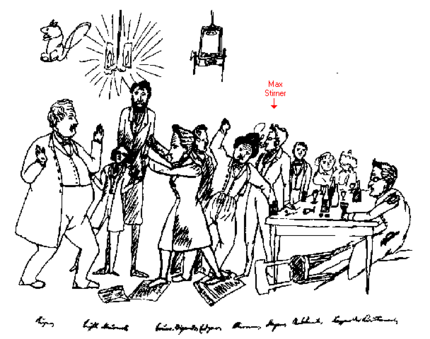 The only portrait we have of Stirner consists of a cartoon by Engels, drawn 40 years later from memory on the request of Stirner's biographer John Henry Mackay. Stirner was working as a schoolteacher in an academy for young girls when he wrote his major work The Ego and Its Own, which was in part a polemic against both Hegel and some Young Hegelians including Ludwig Feuerbach and Bruno Bauer, but also against communists such as Wilhelm Weitling and the anarchist Pierre-Joseph Proudhon. He resigned from his teaching position in anticipation of the controversy arising from his major work's publication in October, 1844. Stirner married twice; his first wife was a household servant, whom he fell in love with at an early age. She died in 1838, soon after their marriage, due to complications during pregnancy. In 1843 he married Marie Dähnhardt, an intellectual associated with Die Freien. They divorced in 1846. The Ego and Its Own was dedicated "to my sweetheart Marie Dähnhardt." Marie later converted to catholicism and died in 1902 in London. Stirner planned and financed (with his second wife's inheritance) an attempt by some Young Hegelians to own and operate a milk-shop on co-operative principles. This enterprise failed, partly because the German dairy farmers were suspicious of these well-dressed intellectuals. The milk shop was also so well-decorated that most of the potential customers felt too poorly dressed to buy their milk there. After The Ego and Its Own, Stirner published German translations of economist Adam Smith's The Wealth of Nations and Jean-Baptiste Say's Traite d'Economie Politique, with little financial gain. He also replied to his critics in a small work titled History of Reaction in 1852. In 1856, Stirner died in Berlin, alone and impoverished, from an infected insect bite. It is said that Bruno Bauer arranged his funeral and was the only Young Hegelian present. Stirner's main work, The Ego and Its Own, also known as The Ego and His Own (Der Einzige und sein Eigentum in German, which translates literally as The Individual and his Property) was first published in 1844 in Leipzig, and has since appeared in numerous editions and translations. A series of articles appeared shortly before this central work, for example The False Principle of Our Education. and Art and Religion, which show the development of his philosophy. In The Ego and Its Own, Stirner launched a radical anti-authoritarian and individualist critique of contemporary Prussian society, and modern western society. He offered an approach to human existence which depicted the self as a creative non-entity, beyond language and reality. The book proclaimed that all religions and ideologies rest on empty concepts; the same holds true for the institutions of society that claim authority over the individual, such as the state, legislation, the church, and educational systems such as universities. Stirner's critique of Hegel shows a profound awareness of Hegel's work, and scholars such as Karl Löwith and Lawrence Stepelevich have argued that Hegel was a major influence on The Ego and Its Own. Stirner employed some of the most important elements of Hegelian structure and many of Hegel's basic presuppositions to arrive at his conclusions. Stirner's argument explored and extended the limits of Hegelian criticism, aiming his critique especially at his contemporaries, particularly Ludwig Feuerbach, and at popular 'ideologies', including nationalism, statism, liberalism, socialism, communism and humanism. In the time of spirits thoughts grew till they overtopped my head, whose offspring they yet were; they hovered about me and convulsed me like fever-phantasies—an awful power. The thoughts had become corporeal on their own account, were ghosts, e.g., God, Emperor, Pope, Fatherland, etc. If I destroy their corporeity, then I take them back into mine, and say: "I alone am corporeal." And now I take the world as what it is to me, as mine, as my property; I refer all to myself. Max Stirner, 'The Ego and Its Own, 15. Stirner has been broadly understood as a proponent of both psychological egoism and ethical egoism, although there is no claim in Stirner's writing that one 'ought to' pursue one's own interest, or that any 'ought' could be seen as a new 'fixed idea'. However, he may be understood as a rational egoist in the sense that he considered it irrational not to act in one's self interest. Individual self-realization rests on each individual's desire to fulfill his or her egoism. An “unwilling” egoist is 'possessed' by an empty idea and believes that he is fulfilling a higher cause, usually unaware that he is only fulfilling his own desires to be happy or secure. A “willing egoist,” in contrast, is a person who is able to freely choose his actions, fully aware that they are only fulfilling individual desires. ”Sacred things exist only for the egoist who does not acknowledge himself, the involuntary egoist … in short, for the egoist who would like not to be an egoist, and abases himself (combats his egoism), but at the same time abases himself only for the sake of "being exalted," and therefore of gratifying his egoism. Because he would like to cease to be an egoist, he looks about in heaven and earth for higher beings to serve and sacrifice himself to; but, however much he shakes and disciplines himself, in the end he does all for his own sake… [on] this account I call him the involuntary egoist. … As you are each instant, you are your own creature in this very 'creature' you do not wish to lose yourself, the creator. You are yourself a higher being than you are, and surpass yourself … just this, as an involuntary egoist, you fail to recognize; and therefore the 'higher essence' is to you—an alien essence. … Alienness is a criterion of the "sacred." A voluntary egoist is the possessor of his concepts; an involuntary egoist is possessed by concepts. Only when the individual realizes that all sacred truths such as law, right, morality, and religion are nothing other than artificial concepts, and not to be obeyed, can he act freely. For Stirner, to be free is to be both one's own "creature" (in the sense of 'creation') and one's own "creator" (dislocating the traditional role assigned to the gods). Stirner's claim that the state is an illegitimate institution has made him an influence upon the anarchist tradition, his thought is often seen as a form of individualistic anarchism. Stirner, however, did not identify himself as an anarchist, and included anarchists among the parties subject to his criticism. He put forth a unique model of self-empowerment and social change through "union activism," although his definition and explanation of “union activism” is unique and does not resemble a standard socialist doctrine of trade unionism. Some scholars see Ernst Jünger's revolutionary conservative concept of the anarch as a more faithful rendition of Stirner's thought. Stirner's demolition of 'fixed ideas' and absolute concepts (termed 'spooks' of contemporary philosophy) led him to a concept of the self that is like a nameless void, impossible to fully comprehend; a so-called 'creative nothing' from which mind and creativity will arise. Stirner arrived at this “creative nothing” by concentrating purely on the self and not on external concepts; he later described the self as an 'end-point of language,' meaning the point at which all description comes to an end, where description is no longer possible. This endpoint is also the place where all description begins, where the individual self can describe (and therefore create) the world of its own meaning. The Unique One is the straightforward, sincere, plain-phrase. It is the end point of our phrase world, of this world in whose "beginning was the Word." Stirner tried to explain his concept of the self as a “nameless void” by using poetry and vivid imagery to give meaning to his words, yet he was trying to portray something “beyond description.” The word nothing was needed to describe nothing, which created a linguistic paradox. Stirner speaks of the Unique and says immediately: Names name you not. He articulates the word, so long as he calls it the Unique, but adds nonetheless that the Unique is only a name. He thus means something different from what he says, as perhaps someone who calls you Ludwig does not mean a Ludwig in general, but means You, for which he has no word. (…) It is the end point of our phrase world, of this world in whose "beginning was the Word." The The Ego and Its Own opens and closes with a quotation from Goethe that reads "I have taken up my cause without foundation," with the unstated next line of the poem being "…and all the world is mine." One of Stirner's central ideas was that in realizing that the self is "nothing," one "owns the world," because as the book states in its last line: "all things are nothing to me" |Max Stirner, Stirner's Critics, 324]. I say: liberate yourself as far as you can, and you have done your part; for it is not given to every one to break through all limits, or, more expressively, not to everyone is that a limit which is a limit for the rest. Consequently, do not tire yourself with toiling at the limits of others; enough if you tear down yours. […] He who overturns one of his limits may have shown others the way and the means; the overturning of their limits remains their affair. Stirner mocked revolution in the traditional sense, and ridiculed social movements aimed at overturning the state as tacitly statist (aimed at the establishment of a new state thereafter). Instead he advocated an insurrection brought about by “insurgents,” people rising above personal, social, political and ideological limitations, to “walk their own way,” and bring about the enlightenment and welfare of others by demonstration and example. Max Stirner, The Ego and Its Own. The revolution aimed at new arrangements; insurrection leads us no longer to let ourselves be arranged, but to arrange ourselves, and sets no glittering hopes on 'institutions'. It is not a fight against the established […] it is only a working forth of me out of the established. […] Now, as my object is not an overthrow of the established order but my elevation above it, my purpose and deed are not political or social but (as directed toward myself and my ownness alone) an egoistic purpose indeed. Among many transformations, the Holy Spirit became in time the 'absolute idea' [in Hegelian philosophy], which again in manifold refractions split into the different ideas of philanthropy, reasonableness, civic virtue, and so on. […] [The philosophers of our time say] Concepts are to decide everywhere, concepts to regulate life, concepts to rule. This is the religious world [of our time], to which Hegel gave a systematic expression, bringing method into the nonsense and completing the conceptual precepts into a rounded, firmly-based dogmatic. Everything is sung according to concepts and the real man, I, am compelled to live according to these conceptual laws. […] Liberalism simply replaced Christian concepts with humanist ones; human instead of divine, political instead of ecclesiastical, 'scientific' instead of doctrinal etc. The thinker is distinguished from the believer only by believing much more than the latter, who, on his part, thinks of much less as signified by his faith (creed). The thinker has a thousand tenets of faith where the believer gets along with few; but the former brings coherence into his tenets, and take the coherence in turn for the scale to estimate their worth by. Stirner proposed that concepts should not rule people, but that people should rule concepts. The "nothingness" of all truth is rooted in the "nothingness" of the self, because the ego is the criterion of (dogmatic) truth. Again, Stirner seems closely comparable to the Skeptics in that his radical epistemology directs us to emphasize empirical experience (the "unmediated" relationship of mind as world, and world as mind) but leaves only a very limited validity to the category of "truth." When we regard the impressions of the senses with detachment, simply for what they are (e.g., neither good nor evil), we may still correctly assign truth to them. In the same way that Christianity liberated men from materialism, Stirner claimed that his theory of the self liberated men from all philosophical concepts. Christianity took away from the things of this world only their irresistibleness […]. In like manner I raise myself above truths and their power: as I am above the sensual, so I am above the truth. Before me truths are as common and as indifferent as things; they do not carry me away, and do not inspire me with enthusiasm. There exists not even one truth, not right, not freedom, humanity, etc., that has stability before me, and to which I subject myself. […] In words and truths […] there is no salvation for me, as little as there is for the Christian in things and vanities. As the riches of this world do not make me happy, so neither do its truths. […] Along with worldly goods, all sacred goods too must be put away as no longer valuable. Truths are material, like vegetables and weeds; as to whether vegetable or weed, the decision lies in me. In place of such systems of beliefs, Stirner presented a detached life of non-dogmatic, open-minded engagement with the world "as it is" (unpolluted by "faith" of any kind, Christian or humanist), coupled with the awareness that there is no soul, no personal essence of any kind, but that the individual's uniqueness consists solely in its "creative nothingness" prior to all concepts. Stirner's work did not go unnoticed among his colleagues, the Young Hegelians. Stirner's attacks on ideology, in particular Feuerbach's humanism, forced Feuerbach into print. Moses Hess (at that time close to Marx) and Szeliga (pseudonym of Franz Zychlin von Zychlinski, an adherent of Bruno Bauer) also replied to Stirner. Stirner answered the criticism in a German periodical, in the article Stirner's Critics (org. Recensenten Stirners, Sept 1845), which clarifies several points of interest to readers of the book - especially in relation to Feuerbach. While The German Ideology assured The Ego and Its Own a place of curious interest among Marxist readers, Marx's ridicule of Stirner played a significant role in the subsequent marginalization of Stirner's work, in popular and academic discourse. Over the last hundred and fifty years, Stirner's thinking has proved an intellectual challenge. His philosophy has been characterized as disturbing, and sometimes even as a direct threat to civilization; something that should not even be mentioned in polite company, and that should, if encountered, be examined as briefly as possible and then forgotten. Edmund Husserl once warned a small audience about the "seducing power" of »Der Einzige« but never mentioned it in his writing. Stirner's relentless disapproval of the most staunchly held tenets of Western thought made him a radical threat to [philosophy|philosophers]]; most writers who read and were influenced by Stirner failed to make any references to him or The Ego and Its Own at all in their writing. As the renowned art critic Herbert Read has observed, Stirner's book has remained 'stuck in the gizzard' of Western culture since it first appeared. Many thinkers read, and were affected by The Ego and Its Own in their youth, including Rudolf Steiner, Gustav Landauer, Carl Schmitt and Jürgen Habermas. Few openly admit any influence on their own thinking. In Ernst Jünger's book Eumeswil, the character of the "Anarch" was based on Stirner's "Einzige." Several other authors, philosophers and artists have cited, quoted or otherwise referred to Max Stirner. They include Albert Camus (in The Rebel), Benjamin Tucker, Dora Marsden, Georg Brandes, Robert Anton Wilson, Italian individualist anarchist Frank Brand, the notorious antiartist Marcel Duchamp, several writers of the situationist movement, and Max Ernst, who titled a 1925 painting L'unique et sa propriété. The Italian dictator Benito Mussolini read and was inspired by Stirner, and made several references to him in his newspaper articles, prior to rising to power. His later writings would uphold a view opposed to Stirner, a trajectory mirrored by the composer Richard Wagner. Since its appearance in 1844, The Ego and Its Own has seen periodic revivals of popular, political and academic interest, based on widely divergent translations and interpretations, some psychological, others political in their emphasis. Today, many ideas associated with post-left anarchy criticism of ideology and uncompromising individualism are clearly related to Stirner's thought. He has also been regarded as pioneering individualist feminism, since his objection to any absolute concept also clearly counts gender roles as 'spooks'. His ideas were also adopted by post-anarchism; Saul Newman largely agreed with many of Stirner's criticisms of classical anarchism, including his rejection of revolution and essentialism. will be drinking blood as though it were water. When others cry savagely "down with the kings"
power and you dare to call yourselves free. Down with dogmatism, down with law." But what is true in his principle, we, too, must accept. And what is true is that before we can be active in any cause we must make it our own, egoistic cause-and that in this sense, quite aside from any material expectations, we are communists in virtue of our egoism, that out of egoism we want to be human beings and not merely individuals." Zwischen 18 and 25, 237-238. Later, Marx wrote a major criticism of Stirner's work, co-authored with Engels; the number of pages Marx and Engels devoted to attacking Stirner in the unexpurgated text of The German Ideology exceeds the total number of pages of Stirner's written works. As Isaiah Berlin described it, Stirner was "pursued through five hundred pages of heavy-handed mockery and insult". The book was written in 1845 - 1846, but not published until 1932. Marx's lengthy, ferocious polemic against Stirner has since been considered an important turning point in Marx's intellectual development from "idealism" to "materialism." Saul Newman calls Stirner a proto-poststructuralist who on the one hand basically anticipated modern post-structuralists such as Foucault, Lacan, Deleuze, and Derrida, but on the other had already transcended them, providing what they were unable to, the ground for a "non-essentialist" critique of present liberal capitalist society. Stirner himself might have disagreed with the poststructuralist idea that, as a product of systems, the self is determined by external factors. For Stirner, the self cannot be a mere product of systems; the self exists beyond language and beyond social systems. It has been argued that Nietzsche read Stirner's book, yet he did not mention Stirner anywhere in his work, his letters, or his papers . Nietzsche studied Friedrich Albert Lange's history of materialism, which mentions Stirner in comparison to Schopenhauer, so it is likely that he was at least aware of Stirner. One of Nietzsche's biographers, Rudiger Safranski, states that Nietzsche had one of his students at Basel borrow Stirner's books from the University Library in 1874, and spoke favorably of them to the student and acquaintances afterwards. Nietzsche's thinking sometimes resembles Stirner's to such a degree that Eduard von Hartmann called him a plagiarist. This seems too simple an explanation of what Nietzsche might have done with Stirner's ideas, if he was aware of them. Stirner's book had been in oblivion for half a century, and only after Nietzsche became well-known in the 1890s was Stirner recognized as an awkward predecessor of Nietzsche. It has been suggested that Nietzsche did not really plagiarize Stirner but instead superseded him by creating a philosophy. ↑ The Encyclopedia of Philsosophy, volume 8, (New York: The Macmillan Company and The Free Press, 1967). ↑ The Encyclopedia of Philosophy, volume 8, (New York: The Macmillan Company and The Free Press), 1967. ↑ Lawrence L. Stepelevich. The revival of Max Stirner. online at: .Retrieved April 29, 2008. ↑ Charles Gide & Charles Rist. A History of Economic Doctrines from the Time of the Physiocrats to the Present Day. (Harrap, 1956), 612 "Max Stirner, who was one of the most faithful members and a most attentive listener, although it does not seem that he contributed much to the discussion …"
↑ I. Berlin. Karl Marx. (New York: 1963), 143. ↑ Rudiger Safranski. Nietzsche: a Philosophical Biography, translated by Shelley Frisch. (New York: W. W. Norton & Company, 2003 ISBN 0393323803), 126-127. Arvon, Henri. Aux sources de 1'existentialisme Max Stirner. Paris: 1954. Berlin, I. Karl Marx. New York: 1963. Gide, Charles & Charles Rist. A History of Economic Doctrines from the Time of the Physiocrats to the Present Day. Harrap, 1956. Safranski, Rudiger. Nietzsche: a Philosophical Biography, translated by Shelley Frisch. New York: W. W. Norton & Company, 2003. ISBN 0393323803. Stirner, Max, James J. Martin, (Ed.) and Steven T. Byington, (Transl.) The Ego and His Own: The Case of the Individual Against Authority. Mineola, NY: Dover Publications, 2005. ISBN 978-0486445816. All links retrieved September 6, 2018. The complete original text in German of "Der Einzige und sein Eigentum"
This page was last modified on 6 September 2018, at 20:23.